Not much changed with your relationship with Kuroo. He still annoyed you at times, stuffed his face with mackerel pike, and enjoyed repeating gossip. Of course he was a bit more touchy with you, but you didn't mind. You enjoyed when he wanted to cuddle as he was always warm. He held you close but also gently as if he might break you, which could happen given his yōkai strength. He would sneak in kiss on the cheek when you least expected and badgered you to spend time outside of working on your book. Yachi had gotten used to him as he often was with you when you went out. It was still only you two, though, when you went to the cafe as Kuroo understood that you needed time away from him. He was around you 24/7 most days. With the heat of summer leaving, fall would slowly begin. It was pleasant weather for the most part with only rain showers every now and then. Despite being a cat demon, he enjoyed going outside when it was raining and just standing in the yard. He would often times try to get you to go with him, but you refused. Catching a cold was not on your list of things to-do list. He was very persistent though, and you eventually gave in just once. "Kuroo, I swear if I get sick, I'm going to shove mackerel pike up your a-"
The bakeneko covered your mouth with his hand. "Uh-uh, we don't use those kinds of words outside the bedroom." He wagged his finger at you with a teasing smirk. Your face grew slightly red and you pushed his hand away. "As if I'd do anything with you in or out of the bedroom," you growled and looked away. He threw an arm around you and pulled you into his side. "[Last name], don't be mad. A nice warm rain shower will do you some good." With that, he dragged you out into the back porch. The rain fell in sheets, though it was warm out. You could barely see across the yard. Just looking at the rain made you shiver at the idea of getting sick. If you got sick, then you'd probably waste time in finishing the book. It was halfway done as of now. You had just started on writing the climax and was a bit stuck on where to go. You had an ending planned out, but was starting to question the ending lately. "Come on, [Last name]." Kuroo tugged on your hand as you stood mere inches from stepping off the back porch. You stood there silently. Kuroo finally released your hand and went off into the rain himself. You had seen the flash of disappointment in those dark eyes just before he turned away. Why were you making such a big deal? It was just standing in the rain. You just had to indulge him for a bit. You knew the reason though. The more you indulged him, the more he would continue to take. He would take and take until there was no more you could give him. Then what? Would you be left as an empty husk as he went back to his world? Or would you let him take one more time? Would you let him take you away from everything you knew and everything you dreamed about? Would you indulge him one last time by sacrificing yourself for him? Sacrifice all you had just for him. Looking at him standing in your yard, arms stretched out, and head tilted toward the heavens, you saw how serene his expression was. Slowly taking off your flipflops, you took one step off the porch. Then another. You continued to walk toward him, allowing the warm rain wash over you. A sense of calmness seemed to envelop you. The only sound you heard was the rain. It seemed to whisper to you. A secret that was only shared between you and Kuroo. He turned to you with a soft smile as you came closer. You hair was plastered to your head and your clothes clinging to your body. Holding out a hand to you, you firmly grasped his and stood by his side. Hand-in-hand the two of you stood in the rain. You could feel the wet grass between your toes, and his warmth radiating from next to you. You still couldn't see past the curtain of rain, but it didn't matter. Tilting your head up with eyes closed, you felt every individual drop of water fall upon your face. It was like a warm kiss compared the stinging ice of the colder months' rains. You never noticed how the rain of these months were different from others. Before, rain was just rain to you regardless of what month it was. You felt Kuroo squeeze your hand. Turning away from the rain, you opened your eyes. He placed a finger to his lip and pointed forward. Looking in the direction, you squinted through the rain. At first you didn't see anything. Then, slowly you saw something glowing through the rain. The glow was a faint blue. You started seeing multiple glowing lights. You watched in amazement as the glows got closer and could see that they were floating flames. "What are they?" you asked in awe. "They're onibi. They're spirits born from the corpses of humans and animals. They only come out during rainy weather. Some are malicious, but most are harmless to humans." He watched them intently. You could see that they were closer now. They bobbed in the air and seemed to do a small dance. "Is this why you go outside in the rain?" He nodded. "They're playful most times. I kind of missed seeing them in the yōkai world." Tearing your eyes away from the flames, you looked at the yōkai. "Why don't you go back? You spend so much time here and you're losing your powers. Why not just go back for a few days to recharge and come back?" Turning to you, his gaze was serious. "It would be nice if I could just go back for a few days and be restored back to my full power, but it's not that simple. The only way I regain all my power is if I stay in the yōkai world for a few years. It might not seem like much, but time moves differently there. A year in the yōkai world is fifty years here." You sucked in a breath. It was much longer than you had thought. "What happens if you...you don't go back?" He looked away, staring at the dancing onibi. "If a yōkai loses all their power then they cease to exist. They just...disappear. No one knows where they go, but they never come back to either worlds." Your eyes widened. The thought of Kuroo vanishing without a trace made you panic. you couldn't imagine him gone for good. You bit your lip and wondered if you should have pushed him to go back to his world. He was at a precarious situation as he had been in the human world for far too long. You didn't want him to vanish because of your selfish desire to have him near. He saw the worry in your face when he looked back. Trying to ease your worry, he said lightly, "Don't worry, [Last name], I have no intentions of disappearing on you. You're stuck with me." Even with the grin he gave you, your worries continued to grow. Still, you forced a small smile on your face and gripped his hand a bit tighter. Turning back to the dancing flames, the two of you watched in silence. Kuroo had gone off to the forest for the day. You were working on your book, but had decided to take a break. Despite the fear of getting sick from the rain, you had stayed healthy. With that worry gone, you were able to focus a bit more on your work. Grabbing a drink from the fridge, you looked around for a glass. Pouring your drink, you headed to the back porch. Taking a sip of your drink, you stared out at the forest. It was a sunny day with a cooling wind. Shading your eyes, you couldn't see the bakeneko anywhere. He was most likely deeper in the forest. Setting your drink down, you sat down and closed your eyes. Dozing off, you woke with a start when you felt eyes on you. Sitting up, you looked around but didn't see anything. About to close your eyes, a voice said, "Are you going to leave him?" Your eyes shot open and you sat up. Eyes landing on the blond bakeneko, you clutched your chest. "Way to give someone a heart attack!" He was squatting near the backdoor. His eyes were focused on a handheld gaming device. He was furiously mashing buttons with intense focus on whatever game he was playing. Seeing him playing a modern game but still dressed in his odd clothes made you stare at the sight. You remembered him from the first night you found out about Kuroo. "K-Kenma, right?" You remembered Kuroo saying that he wouldn't come back as he didn't like the human world too much. He did have an odd love of video games, though. "I thought you went back to the yōkai world?" "I decided to stay a bit to make sure Kuroo doesn't do anything stupid. He seems to be staying out of trouble, so I'll be leaving soon," he replied. "Oh. So why are you here?" You could hear the game's music playing. He didn't even look up, cat-like eyes trained on the screen. "Once Kuroo's time is up, he'll have to stay in the yōkai world for a few years. By the time he'll be able to come, you'll be dead." You winced at his blunt tone, but knew he was speaking the truth. Fifty years was a long time, and Kuroo had mentioned that he would have to stay a few years meaning one hundred or more years in the human world. You'd be long dead by then. "What else can I do?" you muttered, turning your gaze to the forest. "You could live in the yōkai world," he said. You blinked, not expecting him to answer you, but then again he had enhanced hearing. "There are a few humans that have come to the yōkai world and lived there." Kuroo had mentioned this in passing but never elaborated. "Would I be able to come back?" He clicked a few buttons and switched off his game. The handheld disappeared before your eyes. He finally met your gaze with his golden hues. "No. Once a human decides go into the yōkai world, they can never go back." Your brows furrowed. "I went and was able to come back, though." "You were only there for a short amount of time. A human who stays in the yōkai world for a complete day will never be able to go back to the human one. Even if other yōkai try to bring them back, they can't cross over." He shrugged. "No one knows why, but the theory is that once a human leaves their humanity, they lose their connection to the human world." Your gaze averted from his. His eyes were probing you and it made you nervous. "What will happen to my parents? Will they think I just up and left without a word?" "They forget. You disappear from the memories of anyone you ever met. All traces of you vanish like you were never born into the human world," he replied. You clenched your fists. Losing your parents, you friends, everything. You couldn't imagine it. You'd never be able to see them again if you decided to go with Kuroo. "That's...that's a lot to sacrifice." 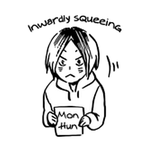 Glancing up, you saw that Kenma had a small frown on his face. "It's the price you have to pay if you truly want to be with Kuroo." He looked away from you suddenly as if not wanting to look at you anymore. "I can tell that you won't do it. You have too much attachment to this world to give everything up. I usually don't say this much, but in the case of my best friend," he met your gaze with a heated one "I can't let him get hurt again." You shrunk back in your seat and turned away. "...sorry," you mumbled. He was only trying to protect Kuroo from getting hurt. It would ultimately be your decision whether to hurt Kuroo but stay with your dreams or make him happy but leave your own dreams behind. Looking back up, Kenma had disappeared. You looked around, but he wasn't anywhere to be seen. Instead, you saw Kuroo coming out of the forest. He had a large grin on his face as he met you on the porch. You decided to keep the meeting with you and Kenma a secret. You didn't want to add anymore to this already complicated situation. "You seem happy," you said with a smile. "Just saw an old friend. I'll have to introduce you to Bokuto someday." He was still grinning widely as you both headed inside. You stared listlessly at your laptop. You were so close to being done, but something had stopped you. The ending you had prepared seemed so lackluster. So fake. So generic. You just couldn't figure out how to fix it so it wasn't a glaring mistake. Another sigh left your mouth before you closed your laptop, rubbed your tired eyes, and stood up from the couch. "Kuroo, I'm going to make something to eat. Do you want anything?" you asked knowing the yōkai was somewhere in the house. You waited patiently for him to reply as you looked around the kitchen for cooking ideas. Not hearing from him, you frowned. "Kuroo?" You glanced out the backdoor, but he wasn't out there. It was dark out and you couldn't see very well. You went up to your room but didn't find him there either. Checking into the guest room and the basement, he wasn't there. Standing in the middle of the kitchen, you felt your chest tighten in worry. Not being able to find Kuroo at all sent your mind reeling. What if he had disappeared like Kenma had said would happen to yōkai who spent too much time in the human world? You felt panic and fear well up inside you. Slowly sinking down to sit on the floor, you stared blankly at the tiled patterns without really seeing them. Kuroo was gone and you hadn't been able to talk to him one last time. The last thing you had said to him was to complain about him stealing all the covers at night. You had wanted to show him the finished draft of your book as it was inspired by him. You wanted to watch a movie and cuddle with him. There was so much you still wanted to do with him, but it was too late. Tears welled up but you didn't even attempt to wipe them away. You just covered your face with your hands and quietly sobbed. You didn't hear the back door open or the footsteps that came closer to you. Kuroo knelt down in front of you and gently pried your hands from your face. You just stared at him through watery eyes despite the fact that he had not disappeared as you had feared. Your cheeks were stained with tears and your eyes slightly red, but Kuroo just chuckled as he cradled your face in his hands, tilting it upwards so he could look into your eyes. "Sorry," he apologized, knowing he was the reason you had been crying. Sniffing, you threw yourself at him. Wrapping your arms around his back, you clutched at his shirt as if you were afraid that he would vanish for real. He held you softly in his arms, squeezing you close as you continued to cry. This time you were crying for a different reason. You were crying with relief but also with a sudden realization. Though you didn't voice your thoughts to him, he seemed to understand. "Well what do you think?" You nervously chewed on your lower lip as Kuroo set your finished draft aside. Sitting on opposite ends of the couch, you had anxiously watched him as he read it. His face did not betray any emotions, which wound up your nerves even more. The month was almost up, only five days left, and you wanted Kuroo to read it before you sent it in. He looked at you with those cat-like eyes, a teasing smirk on his lips. "Well considering I did help you with the information on the yōkai world, I think my name should be mentioned. Give credit where credit is due." "Really? That's all you have to say?" You felt your eye twitch a bit in annoyance. "I'm kidding." The smirk changed to a grin. "I think it's great. The characters are very dynamic and the plot is interesting. I only have one question." You furrowed your brows. "I left it open ended. It's up to you to make your own conclusions." He nodded. "I guess that's nice..."
"Do you not like that?" Panic started to form as you wondered if you had made a fatal flaw. Shaking his head, he gave your leg a pat. "It's fine. I'd like to think that he goes back to the yōkai world to have more adventures." The panic dissolved. Looking down at the draft on the coffee table, you whispered, "In my last ending, he did but I couldn't commit to that. It bothered me..."
"Hmm..." he hummed to himself. You could feel his eyes still on you. "Whatever you think is right, I support." The deadline had ended. You had sent in the draft and after a few weeks, your agent called to say that the people at the publishing company were highly impressed. Though it veered off your usual writing, they thought it was one of the best works they had read that year. You were excited to hear that after polishing it up, you'd be able to have it published. Working furiously, you forgot about Kuroo and his impending departure. You worked late into the nights, slept little, and if Kuroo wasn't there, would have eaten little. The bakeneko was happy to see you filled with such passion. He encouraged you while also making sure you took care of yourself. By the end of the month, you had sent in your polished draft with confidence. By the end of the month, Kuroo had to leave. You stood at the edge between the forest and your backyard. Kuroo, standing so he faced you with the forest behind him, smiled down at you. You found yourself frozen in fear. You didn't want him to leave. He would be gone for a hundred or more years. You would never see him again. You had grown so use to having him around your house; his presence was reassuring. You had grown hopelessly attached to him despite what you knew. "Hey, don't frown like that. You'll get wrinkles," he joked, gently poking your cheek. "How can you joke right now?" Your eyes watered. He chuckled humorously. "I wanted to lighten the mood a bit. You look better when you're smiling and have passion in those eyes, [Last name]. This last month you worked so hard and despite all that, the passion in your eyes made you look even more stunning than before." Looking at him with lowered lashes, you smiled with a hint of embarrassment. "Flatterer..."
"It's true." He patted the top of your head. He hesitated before gathering you into his arms for a hug. You breathed deeply as you relished in his embrace and held on to him like a life raft. "[Last name], come with me." His request was barely a whisper that you nearly didn't hear it. You stiffened at his request. Pulling back from him, you met his dark gaze. So many emotions swirled in those cat-like eyes. You could feel your heart squeezing painfully. You had been conflicted for so long with this. You wanted to be with him. You also wanted to do more in this world. You could only have one of those options. He held out a hand towards you. "I know this is selfish of me to ask, but please. I tried to not think about what it'll be like when I can't be with you, but it's painful. You can become a writer in the yōkai world too. We can be together..."
You stared at the offered hand and then glanced back at your house. You turned back to Kuroo. "I...I care about you, Kuroo. I care so much about you...I can't express how much in words. Yet, I've worked so hard to get where I am in this world. Leaving it all behind, including my parents, is so much to sacrifice." Reaching out, you grasped his hand with both of yours. Squeezing his tightly, you smiled sadly. "I'm sorry, Kuroo. I...I can't come with you. If I do, I know I'll regret it for the rest of my life. I don't want to spend all eternity feeling like that." Leaning forward, you kissed his cheek and pulled away. Releasing his hand, you took a step back. Looking at his face you could tell that hee wasn't angry. He knew he had a fifty/fifty chance in convincing you to come with him. He took a gamble and lost. Kuroo smiled, though the deep sadness in his eyes told you something more. "I want you to be happy, [Last name]. I'm going to miss all those mackerel pike meals, though." He grinned before taking a step toward you and placing a chaste kiss on your forehead. Turning, he walked into the forest without looking back. You watched until you couldn't see him anymore. Heading back to your house, you stood in the kitchen. Everything felt bigger. Lonelier. You had made your choice. Now it was time to live with it. One hundred and seventeen years had gone by in the humans world, but for Kuroo it had only been two years and a few months. He felt rejuvenated from being back in the yōkai world. His powers were back, he had gained a bit more as well, and he was content. The grass crunched under his bare feet. The town hadn't changed much except for the growing technology and new people. It was a misty day where most people stayed in. The chill was setting in already. Everything was quiet except for the occasional bird chirping or squirrel running by. His keen eyes automatically picked up on what he was looking for. Walking closer he saw that despite being weathered, the tombstone was kept in good condition. Scanning the writing, he smiled sadly. It seemed that you had wanted to be buried in the small town. Despite it not being where your parents had decided to be buried, you couldn't seem to let go of the town where everything had happened. Kuroo had heard from Kenma, as he begged the blonde to go check on you every now and then, that you had done well for yourself. Having become a world famous writer, you had traveled the world. You had published a few more books as well. Though you had the means, you never moved out of your house. Despite all the possible suitors, you stayed single. You kept in touch with Yachi and even looked after her own children. Having a few close friends, you never seemed to be alone. From Kenma's view, you were happy. Standing there for a bit, Kuroo patted the top of the tombstone. "Sorry I couldn't see you until now. I'm glad everything worked out for you, [Last name]." He turned away from the grave and slowly made his way through the cemetery. He had missed you while in the yōkai world. Though he tried not to think of you too much, he found himself remembering all the things that happened. Though he hadn't been able to convince you to come with him back then, he was at least satisfied to know you lived a fulfilling life. The gates of the cemetery loomed before him but he stopped walking, his ears picking up on movement from behind him. Here's the second part I promised. This concludes the mini-story. Honestly, I couldn't see the reader leaving all their dreams and ambitions behind for Kuroo, no matter how great he is; this is more due to my own experiences and emotions. I might sound selfish, but I couldn't/wouldn't throw my life away for someone. I wouldn't be happy in the end and continually blame myself for giving up on what I wanted. I hope the ending was satisfactory even if it wasn't what some of you expected. I'm dead. that was truly spectacular!! Who says that end line? I love this. Despite not having a "happy" ending, this is one I feel that makes sense? I like to think that she never forgot about Kuroo, and in a way this story reflects the same story that Reader-chan was telling and publishing. I love this even though it makes me sad because it's still realistic and plausible enough in a human/human relationship. Is it too much for me to hope the ending is what I believe it is? That maybe, just maybe she had told others, so he was never truly forgotten.. Honestly speaking, I'm so torn with emotions right now. A part of me really wanted the two of them to have a good ending, but at the same time I'm quite happy with how this turned out. Kuroo and the Reader both knew of what could possibly happen, if he had stayed or if she had left, and came to terms with it. Your new house was small but it suited your needs as it would only be you living there. Located on the outskirts of the town, your backyard bordered a dense forest. It was actually very peaceful and private as your only neighbor was on your right. The town itself was quaint with small shops in the town center, a community park, theater that had probably seen better days, and a few restaurants dotted here and there. It was a needed break from the large city you had originally grown up in. After some suggestions made to you by your friends, you decided to look for a self-help book on relationships. It was simple enough to find the book at the store as Romance For Real Dummies was the first book you saw. Having flipped through it quickly, you purchased the copy with hopes of understanding relationships and romance a bit better. The authors were self-proclaimed love gurus and seemed to know what they were talking about. "Yukie-chan!" You smiled as you waved to the third year female. You often visited the team while they practiced to see their third year manager. Shirofuku Yukie was your sister-in-law as your older brother married her older sister. Though you two didn't know each other well at first, you came to be very close. She was very friendly and fun to be around. Plus she enjoyed eating your food no matter what it was or how it looked. You enjoyed practicing new recipes and she was always willing to be your guinea pig. Today, though, you had made it at the end of practice, as you were busy helping out the librarian. Still you wanted to pop in just to see everyone. "[First name], how was class?" she asked as you sat down next to her on the bench. It had been a week since running it Oikawa and learning of the nickname the setter had given to Ushijima. The captain didn't talk about that event since then. You had wondered how close Ushijima was to Oikawa, though you had a feeling the setter didn't care much for the former. Perhaps the nickname was something used as a way to annoy the male, though Ushijima didn't seem all that bothered by it except when you used it once. Still you were curious of the relationship between the two, but decided to drop it for now. You waited patiently on the sidelines of the gym near the entrance. It was almost time for the Shiratorizawa Academy's volleyball team to end its practice match. There were many students on the sidelines watching the practice match between another college level team, though most knew the outcome already. As always, your school's team was beating the college team. Soulmate AU: Everyone is born with a tattoo on the inside of their wrist of their dominant hand. Only two of the same tattoos exist in the world. The identical tattoos mean that the two people are soulmates. People can go through their lives without ever meeting their soulmate. 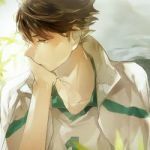 When you found out Oikawa Tooru was your soulmate, you were beyond ecstatic. 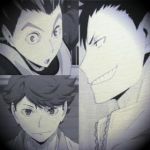 The idea that the famous setter and captain for Aobajōsai High's volleyball team was your soulmate sent your mind reeling. 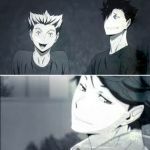 You had always admired him from afar, you never thought you'd be able to get close to Oikawa until now. You gave him friendship chocolates on Valentine's Day in his locker and went to all his matches, but never actually talked to the third year. After that day of your embarrassing confession, your friend dragged you to eat with Oikawa and Iwaizumi. She wanted you to get to know your soulmate because she wanted you to "know what you were getting into" and see what kind of person he really was. The two boys didn't seem to mind having the two of you join their lunches. Iwaizumi and your friend got along very well that you wondered why they weren't soulmates. You on the other hand was still very nervous around Oikawa. You hummed to yourself as you put the finishing touches to your sandcastle. The sandbox at the park was always the first thing you went to. The other children tended to head to the monkey bars or the swings. You wanted to build things from your extensive imagination. Smiling down at your work, you looked around for your mother. She was sitting on a bench chatting with another woman. You wanted her to see your creation and was about to call for her, when a ball came flying through the air and landed in the middle of your creation. This was supposed to be for my baby Kuroo's birthday, but I'm not sure if I'll have internet connection overseas (I'm going to Australia for holiday ) So I'm posting this two days prior! After contemplating it for a couple of seconds, you decided that it wasn’t worth trying to move the mountain beside you for the blanket. And that was how your gaze landed on his sleeping profile, and you wound up staring at him, like a creeper. Then, your eyes widened after all the fuzzy thoughts in your mind had cleared. Breathe | Kuroo TetsurouDisclaimer: I do not own Haikyuu!! or any of the characters that are mentioned. I am not making any profit from this fic and I write purely for the love of the characters. Haikyuu!! is the property of Haruichi Furudate. The door jingled open, chiming the entrance of someone entering the small apartment. He gently kicked off his shoes, neatly placing them into the shoe rack. It was filled again, but the darkness of the apartment made him think otherwise. His eyes narrowed as he walked into the empty and dark room. It felt nothing like home. But he knew this was temporary. It was always temporary. He missed you. He missed you so so much. With every smile came the thumping beating of his innocent heart. With every laugh came the inevitable feeling of love that rushed through his veins. It was an indescribable feeling - a feeling he could not even bear to understand, but it walked with him like a patch on his shoulder. “Tetsu! Let’s go already!” You cried out with that signature smile that made his mind go blank. Nothing really could make the captain of Nekoma completely blank out other than the sweet sweet voice of you. If only he could hear your voice once more. Just once more. “Tetsu? Hey, take off your headphones already!” You giggled and he scoffed, slipping his headphones off to let your sweet voice overcome his senses. But why did this have to happen? “Happy Birthday, Tetsu! I love you so much!” A large wrapped box was in your arms as you extended it towards him, giving nothing less than your million dollar smile. Your brother's already at the airport, [y/n]. Weren't you picking him up? You panted, carelessly throwing yourself against the airport glass door and running inside. Your mom's words were on repeat in your mind, making you so mad at yourself you couldn't even notice people around staring and whispering at your careless action. "Oh God, I'm so late..." You whined, running up the stairs and hoping you'd find your brother at the first floor cafe your mother indicated you to go. Your brother was coming back to Japan to visit from college today, and you had promised him over the phone you'd pick him up at the airport. You really missed him. He had been away for almost three years now and soon enough, he would be over with college and permanently back. For now, you had to feel glad he even had a break to visit. Home is Where You Are | Kuroo TetsurouDisclaimer: I do not own Haikyuu!! or any of the characters that are mentioned. I am not making any profit from this fic and I write purely for the love of the characters. Haikyuu!! is the property of Haruichi Furudate. Kuroo has been staring out the train window for the longest time. His phone had a countdown timer indicating how much longer he had until he'd see you again. It's been a month. A little over a month actually as both of you couldn't make time due to unforeseen events. But that's okay, you guys figured it out. His fingers drummed against the armrest, an indication that he was very much anxious to see you. And he sighed as he slumped his head back on the headrest. I'll head over to the station before you arrive! It was a miracle how you could hear Kenma’s voice over the sound of Yamamoto’s boisterous laughter in such a crowded place. Silently agreeing with the pudding-head setter, you continued sipping on your drink, feeling a little claustrophobic being squished between Kenma and Kai. The members of the volleyball club often went out together like this after practice. Usually it’d be to the convenience store to grab a quick snack, but since practice ended early that day, they decided to go to a fast food restaurant for a bite. It wasn’t easy to find seats for ten people, which was why the entire team ended up sharing the largest table they could find in one corner of the restaurant. The day your little baby finally became a big boy. You’d planned on having a party to celebrate his birthday, inviting some of the children from the daycare to celebrate at the local restaurant, but Kenma had staunchly refused. There would be strange kids, strange adults and he’d be in a strange place, Kenma had whined. Couldn’t they just stay home? Not even having his brothers there had assuaged his fears. So instead the invitations were given only to their uncles and that was that. Practice ran late (or rather, you was sure your husband and his band of merry idiots didn’t want to help with the cooking and baking) and you’d been left alone to bake the desserts. Walking out towards your balcony with laundry in hand, feeling lucky that today's weather was perfect. Laying out your clothes on the hanger, you place your undergarments near the door, away from the potential pervs. You hear a soft meow from your right, and turn to look as it stands on the balcony railing next door. You smile and head towards the cat and it jumps onto your own balcony, making it easier to pet it. It enjoys your touch, purring in satisfaction at your gentle caress. You stop petting the cat and walk towards the kitchen, grabbing a bowl of milk for the cat. Once you exit the balcony, the cat cautiously heads towards your undergarments, your bra to be exact. You rolled your eyes at your best friend's voice and sighed, running straight to the basket and scoring, albeit with trembling hands. You were never the sports's girl, in fact you hated it. P.E had to be your worst subject and you had to force yourself through it every time, thinking about how you could call in sick and just watch your classmates from the bench. It wouldn't be fair to your grade though, so you had to endure it. Your best friend was the exact opposite: she loved P.E and P.E loved her. She had the best grades and every single game was her time to shine, so she would always try to motivate you and keep you on her team to make sure you tried your best. It had never worked and you were almost sure it never would, the bunch of laziness you were. Still, you couldn't ignore how happy she was when you scored and smiled back at her. "[f/n]-chan, that was so good! I think we finally found something that suits you: basketball's your thing!"